The first time BT mis-sold me TV was when they brought fibre-to-the-cabinet to my address. We signed up immediately for the best possible BT broadband service, and added whichever TV package happened to be appropriate. They sent out a tv box and we waited for the broadband to work. The broadband worked. The tv didn't. I mean the freeview bit worked but none of the channels that come through the internet did. Obviously lots of calls to helplines. On one of those a very nice and helpful lady upsold me onto a different package, explaining that would fix the problem. I mean, odd but ok, I would get nice tv. So that was the second time I was mis-sold TV by BT. I had paid a £35 installation fee which was pointless, but I never complained about that because they had given me what has been serving as a fairly nice freeview box, so fair enough. So yeah, my first week or so as a BT broadband customer involved being mis-sold tv twice. They told me they would call back in a couple of months when it was available. Well they never called back, but it turns out that is the only good thing they ever did, because for the next year and more I occasionally checked their website and (to be fair) they never offered to sell me a tv package as it was not available at my address. I also checked a publicly available broadband checker, and the date for fibre multicast kept being pushed back. It seemed like it was due to come every two months, until about a week before the end of the month when it would go back a couple of months. I happened to check it on July 31, 2015, and amazingly, it was available! So I logged onto the website and sure enough they were prepared to sell me BT TV. This meant I could watch the Ashes without having to use Sky TV. For some reason they were only prepared to sell me the ultra-hd package, which I didn't need, and this came with a £44 engineer charge, which was unnecessary because I had already laid the ethernet cable to my tv. But ok, and the ultra-hd box comes with a nice large hard drive. So the great day came at the start of August and the engineer came round. He was delighted not to have to do anything except plug in the box. First of all he installed the wrong box, a non ultra-hd one, and then he installed the correct one. The TV didn't work, but he said that was because he installed the wrong box first, and it would work soon. So I booked a second engineer visit for the Monday. He walked in the door and within about a minute said: nope, you are not getting tv and you are not going to get it until at least September 30. The fibre multicast at my cabinet is not getting installed until at least then. Or indeed for any other cabinet in the postcodes KY14, KY15 or KY16. I rang up BT to complain while he was here and put the engineer on to talk to them. They accepted finally that indeed I had been sold tv that wouldn't work. Since it was going to start working on September 30 (maybe) I agreed to hang on until then on the basis I wouldn't pay for tv services until then. I got a note of the complaint reference number. I unplugged the new box and put it away so that it would be clean if I ever needed to return it - if the tv service never started for example. And yes, that was the third time I was mis-sold BT TV. For some reason, they had falsely believed that they would be able to supply me with broadband TV, but they were not able to. For some weird reason I thought that I wouldn't get charged until the end of September - because they had told me that. Until I checked the bill today and discovered I'd been charged the £44 and lots of money for the TV services that I'd never received. And that I never had any possibility of receiving, because our cabinet can't supply it, and there has never been a single day since it was installed that it was able to supply this address with TV over fibre-to-the-cabinet. Oh, and unsurprisingly the date has moved again from September 30 to October 30. So I rang up to complain again. Well actually first I tried the online chat thing, but it turns out that he wasn't able to help with billing so they got billing to ring me up. Which meant of course starting with the explanation again. Both the chat guy and the woman on the phone told me that the fault had been resolved. I.e. they thought I was getting TV. Even though this - as I might have made clear - is impossible. So after raising a complaint it had been logged as resolved, and they started charging me for a service which (have I mentioned this?) they are not able to supply. The woman I talked to took a very long time to understand that we can't get tv. She kept telling me she would put me onto another package. Eventually she went off to talk to some techie people, and when she came back she accepted that we couldn't get BT TV at this address. At that point she finally agreed that it would be reasonable to cancel my tv, I could return the box, and she would refund all the tv charges after installation. But I would still have to pay £44 for the installation where the guy came and installed the wrong box, then the right box, then told me it would work soon when it never did. When I said that was unacceptable, she said I had to pay it because I had had 14 days to cancel it after ordering on the net. I suppose I could have cancelled it, but I had been told I was going to start getting the service on September 30, and (I'm good with a calendar) the end of September is more than 14 days after the start of August. (If they had not promised this then obviously I would have cancelled it way back then.) She said that she couldn't authorise the refund of the £44, but could flag it up to the manager, which means being called back on Monday because he doesn't work weekends. So now I'm waiting to be called back. So for clarity this is my complaint towards BT TV. I've been mis-sold BT TV three times. Three times I have agreed to take on the service in exchange for money, and three times BT has failed to supply it. BT has claimed the fault as resolved even though it wasn't - as another part of BT was able to confirm. 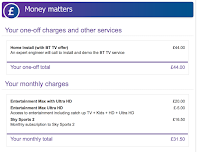 I've been explicitly told that I would not pay TV fees until the end of September, then been charged those fees. BT has claimed I should pay an installation fee for a service that (I may have mentioned this) had zero chance of ever working. In the process of mis-selling me TV three times and failing to resolve the issue, I've spent much time on engineer visits which did me no good, and lots of time on the phone and chat line, trying to resolve the issue. But actually what really galls me is not so much the catalogue of incompetence and mistakes, but the fact that there is no history there. Somehow it seems to me that when a company sells you a product three separate times that they can't supply, the company should kind of have it recorded that they are treating this customer very badly, and if something goes wrong please be very nice to the customer. Instead of which, this morning I had a BT TV rep trying to tell me I needed a different TV package, which would have been the fourth time I'd been mis-sold if I hadn't firmly told her I can't get TV - and when she checked she confirmed this. And that's why I've written this blog post. And also so the manager can read it on Monday instead of me explaining everything yet again. Obviously BT will refund the £44 that we should never have charged because our systems incorrectly thought we could supply a service that we couldn't. BT will take back the commitment we make new TV customers make to at least another year calls+broadband because that was undertaken as a result of mis-selling. As a no-fault ex-gratia gesture of apology we will do this nice thing for you, because when we say we are sorry for mis-selling and then charging you after promising not to, we actually mean it. Following was originally a comment by me but now I've started updating the post so it makes more sense to go here. Ok for those of you following this adventure, the manager rang up in the advertised slot. I mentioned this blog post but I got the impression he didn't read it. He did quickly agree to refund the engineer visit. He said he couldn't cancel the termination condition of the contract but said he would add a note on the account that if we cancel early we shouldn't be charged a termination fee. So that - more or less - deals with the key points 1 & 2. I did emphasise that while it was good that the immediate issues were dealt with, I'm still extremely unhappy with the way I have been treated with lots of inconvenience and mis-selling. He promised me a letter of apology, and I guess I will have to wait to see what it says before I can judge whether point 3 is satisfied or not. I can certainly imagine accepting the apology - it's hard to imagine what BT can do to make me want to stay with them instead of waiting the minimum possible time before looking for a broadband supplier with customer service. So yesterday I talked to the manager, and you can see my reaction immediately afterwards above. A few minutes later I got two emails about refunds. One was for £44 for the engineer visit. The other one was for £8.48. Which was a weird amount as we'd paid just over £52 in TV fees. I thought maybe the rest was coming. This agent verbally guaranteed that the full amount would be refunded on my next bill. He also said he would contact the manager who promised the refund to find out if the rest had been issued, and then email me the answer. But it does seem to me that if a refund has been promised it should show up in their system (even if not actually credited to my bill yet). If that is not the case it's a horrific systems failure. Let's remember the summary: I have been mis-sold tv three times. The last time I was promised I would not be charged for a few months. I was charged. Then (yesterday) I was promised a refund. Today BT cannot even tell me whether or not that promise has been fulfilled. The agent also asked what he thought BT could do to make me happy. All I could say was to let me get out of their clutches as soon as possible. Which (I didn't say this) means waiving any future commitment (we did commit to a year in about May), and also it would be nice to get an actual refund instead of a credit to our account. Actually I can think of something BT could do. Remember that I am only a BT broadband customer because I expected to get TV. My daughters would still like BT TV. Since you can't deliver it via FTTC, why not lay another phone line to my house and give us BT TV via ADSL, obviously at no cost to me except ongoing TV charges? Please please please, somebody from BT read this either tell me I've been badly let down, or if not let us conclude that the way I've been treated is par for BT customer service. Comments are open. It's 24 hours on and no information about my refund. It might exist, it might not. I never got an email from the representative I talked to yesterday - the one who thought it was unreasonable for me to try to find out if a refund had been actioned or not. 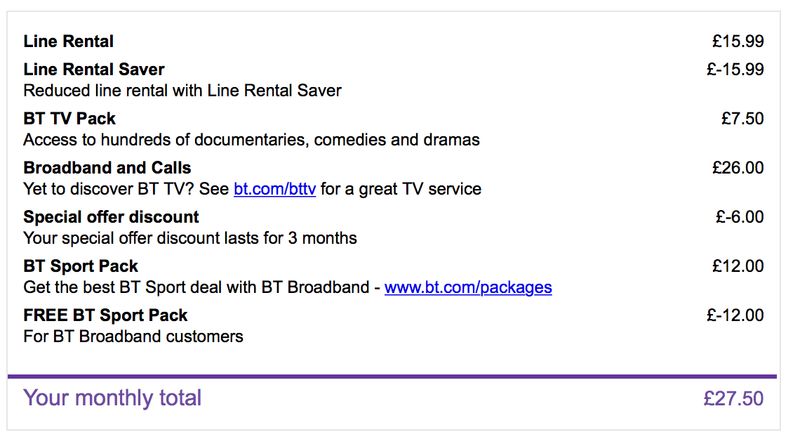 I did get one email from BT about the TV service though. It offered me an upgrade for my existing service for three months for a cheap price. Brilliant! I mean I know it's a generic email, but it is quite amusing. Amusing, though still incompetent, since it was targeted at me as a customer, so they should have known I can't get it. I did decide to dig out the three confirmations of the three times I've been mis-sold BT TV... so for your enjoyment here they are (click for larger versions). The first two are from June 2014, the third from July 2015. Although my current upset dates from the last occasion, in many ways I find the first one the most interesting. 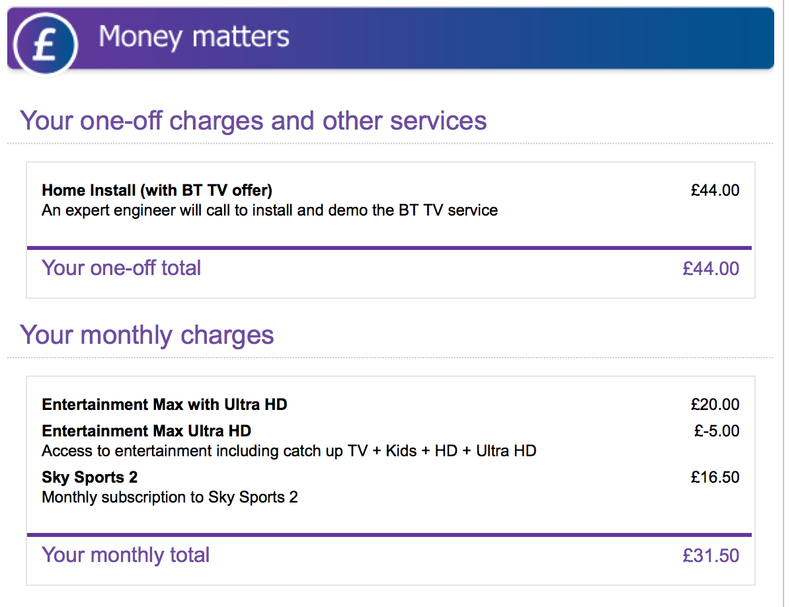 I was never charged the £7.50 per month, I assume because somewhere in BT's system they figured out I couldn't get TV. But I was never notified of this and given the chance to change. And indeed before any human at BT told me I couldn't get TV, the middle order was enacted. 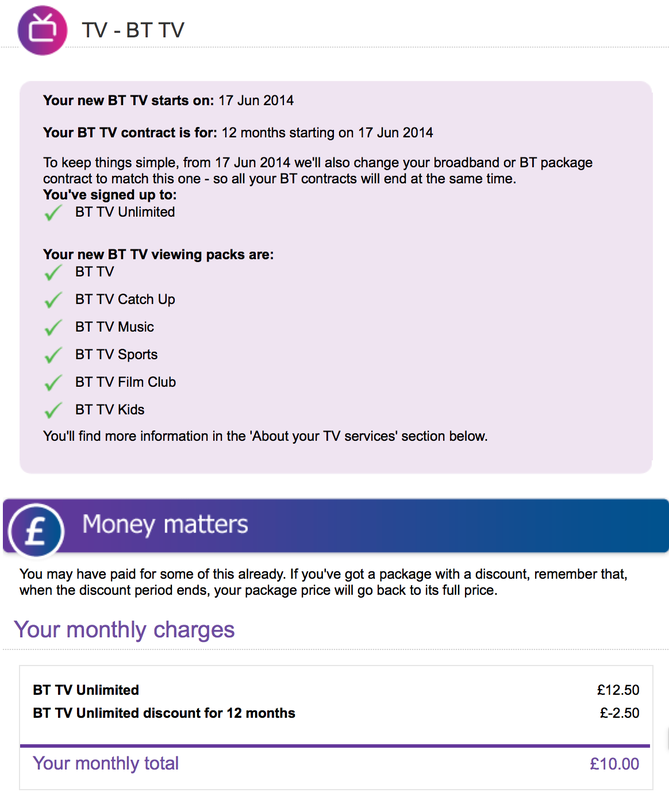 So yeah, I've finally realised I became a BT broadband customer after a bait-and-switch. I took it on the basis we could get TV, and not only has it never been available but BT never told me about the switch. Well actually, that's not true, since eventually in June 2014 a technical support person told me I couldn't get TV, and they admitted the second order (not the first) was mis-selling. But BT took an order (the first one) and never informed me they couldn't fulfil the order until after everything was installed, and I was committed by inertia to their broadband product. So it's not just BT TV I was mis-sold three times, I was mis-sold BT Broadband as well. Just had a call from a member of the @BTCare team. I tweeted this blog post and eventually they asked me to contact them and eventually they got back to me. It was a pleasure to talk to somebody from BT who had actually read this blog post. Of course she said that obviously the refund should have been actioned immediately on Saturday without me having to go through managers and figure it out. We had quite a long discussion about exactly what the refund should be. It turns out, for example that a line of -£30 for rental adjustment on my last bill was actually an earlier attempt to make good the lack of supply of TV - but then I was never told in person or email about this. I'd seen the line in the bill but had no idea what it was. So in fact I had been partially refunded but not yet completely. The BTCare person is going to email me exactly what they think they have charged and refunded so we can compare notes to make sure we agree what the refund situation is. Actually the exact details of the refund are not critical to me - I'm sure we can resolve that between us. What is probably most important to me is that she said she has taken ownership of this and I will have her contact details. This is what is most frustrating about dealing with BT customer services. It's not that you don't always get the answer you want (inevitable), or even that quite often the answers are completely wrong (unfortunate but we are all human). What is most frustrating is the fact that you are always starting from a blank slate, and can never talk to somebody who you have previously talked to. I did take the chance to emphasise that actually the refund issue should never have even come up, and while I'm sure it can be resolved, I'd also like at least some gesture about the fact that I'm a broadband customer on the basis of mis-selling, even though I don't expect them to be able to supply TV. So I'm feeling a lot happier, and mainly because, as I just said, I feel like I have a contact who knows the situation and what things I am and am not worried about, rather than just hitting whichever sequence of buttons gets me off the phone. 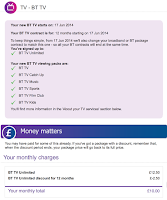 Wrote a new blog post with a brief update and to say Thanks to Lisa from BT Care, and Sorry. BT is dreadful. Mainly because it is made up of disparate departments/divisions which do not communicate properly with each other. If only they could treat their customers holistically. It should be up to them to provide that service and keep a proper record of all the group's dealings with each customer. Not down to the customer to do that job for them. An organisation as big as BT needs centralised control and accountability. It has neither. Thanks Yvonne, I completely agree. In my case, for example, it's ridiculous that they kept telling me that my tv was working when another part of BT knows I can't get it. Oddly it's only now that I remember a key point, which is that it was the TV offering in the first place which helped us decide on BT broadband. Otherwise we would have shopped around for other broadband suppliers, possibly with a better reputation for customer service. But the TV which helped us decide on BT has never been available to us.